Your iPhone can keep a number of text messages, photos, videos and notes. Sometimes you need to delete some notes or it was just done by mistake. Now the question is how to get back these deleted notes. Making a backup of the important data, messages or notes is a good idea. It will make your mind tension free and relax from the worry of accidental data loss. By using this backup concept you can manage the bulk data easily. In case of accidental data like water damage, system crashes, factory reset or wrong deletion, you can follow the methods discussed in this article to recover your deleted notes from the iPhone. iCloud is is widely used service among Apple products, such as iPhone, iPad or Mac. 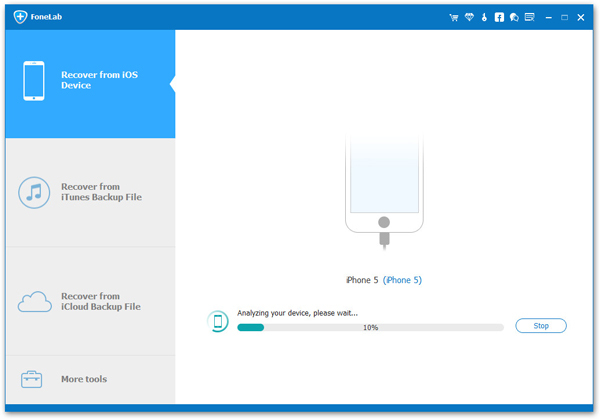 It offers free remote backup service to help iPhone user store valuable informative on iCloud servers. 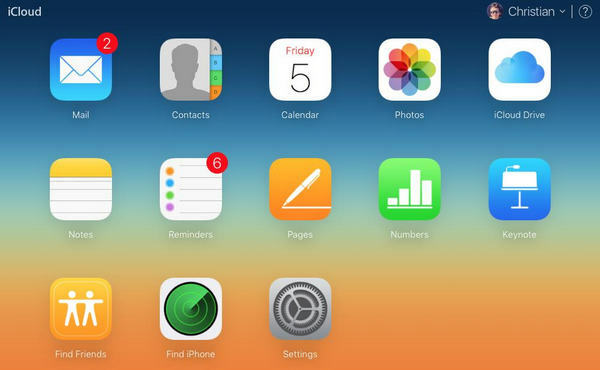 After signing iCloud on your iPhone, the notes are automatically saved to cloud servers as well as contacts, photos. If you were fortunetly enough, then you can find the deleted notes from iCloud. Step 1: Now find a device being connected to Internet, computer is preferred. Step 2: Open a web browser and type iCloud.com in address bar. Step 3: Type the correct email and password of Apple ID, which should be the same be used on the iPhone. Step 4: After login, you can see a panel like the following screenshot. Simply click on "Notes", you will find all previous notes from there. However, if you were not syncing Notes with iCloud or couldn't find the notes in iCloud, there is still other ways around to recover the deleted notes. Please don't be panic. Just keep reading on the below sections. I am sure there is right one that works in your case. Androidphonesoft iPhone Data Recovery provides a quick and efficient recovery alternative for iPhone. It allows you to get lost media file, contacts, text messages and even deleted notes in just a few minutes. The latest version comes with streamlined user interface that makes the process of restoration and backing up fast and efficient. With the help of this iPhone data recovering program, you can also retrieve lost data from iTunes or iCloud backup. Now plug-in the targeted iPhone, iPad or iPod with theUSB cable. 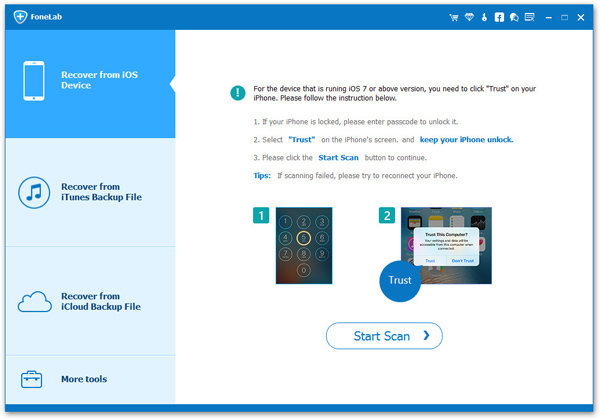 Once the device is detected by iPhone Data Recovery, click "Recover from iOS Device", which is located at the left sidebar. After clicking on the "Start Scan" button, scanning will start of all the files. These all files will listed in the left column, along with notes. In the "Notes" Tab, you will see all deleted and present notes classified in two categories, in two colors. Here you can highlight the notes, which you want. At the end of the process, click on the "Recover" button to get the notes in the format of HTML file, into the destination folder. If you had ever backed up iPhone with iTunes, then iPhone Data Recovery software is currently the best choice to retrieve the deleted files. And it is much better than using iTunes because you can preview and select the deleted notes for recovery. However, this can't be done with iTunes, which over writes all existing notes if you chose to restore the iTunes backup. Instead, this software enables you to preview those notes very easily. Therefore, it is a very convenient method to get the deleted notes from the iPhone. Step 1: First of all you need to launch iPhone data recovery program. 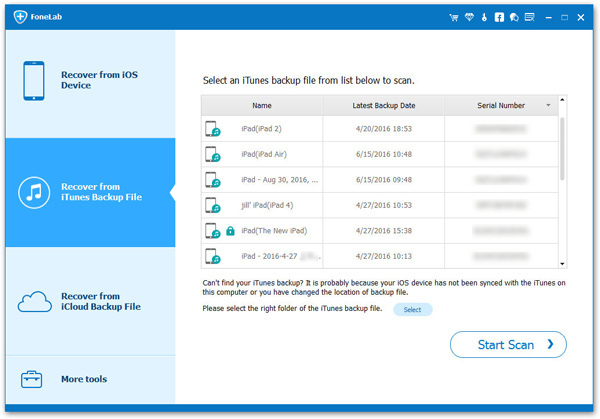 Now click on "Recover from iTunes Backup Files" given on the home page. Step 2: A few seconds later, all iTunes backup files are loaded on the main window. Select one that contacts the deleted notes. Now you have to click on ‘start scan’ button. After that from the pop-out windows, choose the data that you like to restore and click ‘Next’. Step 3: After completion of the scanning process, you can see that all the files are listed in categories. Now you can go to the "Notes" column, choose the lost notes from the preview. 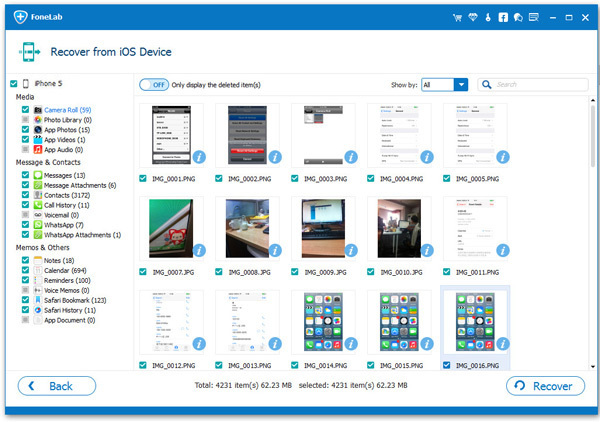 At last, click on "Recover" button to your PC or to your iPad, iPhone or iPod. According to the description of above methods, you can see each method has its own pros and cons. Restoring from backup is the easiest way but many people forgot to backup the phone. Under such a case, Method 2 is the only method left. In one word, iPhone Data Recovery is the program you shoukd take a copy if you really want to recover lost data from iPhone, iPad or iPod. It has all the features and functions for file recovery and restore.